Web Security is possibly today’s most noisy and multiaspect field that is a prior task in any organization. It is worth saying for an introduction that Web is a system of interconnected documents accessed via the Internet. On the whole the term called “WEB”is known to be a human knowledge and culture storage, which enables users in remote sites to share their ideas and thoughts in all aspects of a common computing project. Since unknown “intruders” are concentrated on web applications, customer databases should somehow be well-protected. As a result, industry is paying increased attention both to the security of the web applications and also to the underlying computer network and operating systems. Web application security is a branch of information security dealing mainly with security of websites and web applications. Web application security mainly relies on the principles applicable to Internet and Web system security. Web applications use such programming languages as PHP, Java EE, Java, Python, Ruby, ASP.NET, C#, VB.NET or Classic ASP. Hackers find different ways compromising the corporate network or the end-users accessing the website, e.g by drive-by downloading(during viewing an e-mail message, clicking on a false pop-up window). The majority of web application intrusions occur through cross-site scripting (XSS) and SQL injection attacks Cross-site scripting (XSS) is a type of web security vulnerability which enables attackers to penetrate into web pages viewed by others. SQL code injection exposes a security vulnerability occurring in the database layer of the application. It is an example of a more general class of vulnerabilities that can occur whenever one programming or scripting language is housed inside another. SQL injection attacks are also known called SQL insertion attacks. Open Web Application Security Project is an open-source application security project that includes corporations, educational organizations and individuals all over the world. This community works to create all available articles, methodologies, documentation, tools, and technologies and to protect all his achievements has created the Web Hacking Incident Database. As for technical solutions, they are used to cover the overall process of designing, building and testing secure web applications. At a high level, these solutions include Black Box testing tools such as web application scanners, vulnerability scanners and penetration testing software. Unlike source code scanners, web application scanners don’t have access to the source code and detect vulnerabilities by performing attacks. White Box testing tools include measures for preventing exceptions in the security policy of an application or through “deceptions” in the design, development, deployment, upgrade, or maintenance of the application. Fuzzing-Tools used for input testing. Fuzz testing or fuzzing is a software testing technique, that provides invalid, unexpected, or random data to the layers of a computer program. Web application firewalls (WAF) is used to provide firewall-type protection at the web applications. Password cracking tools for testing password strength and implementation. If you visit NSAudtor.Com you will make sure that the full network security list is available here. Nsauditor Network Security Auditor is a Network Security And Vulnerability Scanner that allows auditing and monitoring network computers for possible vulnerabilities. 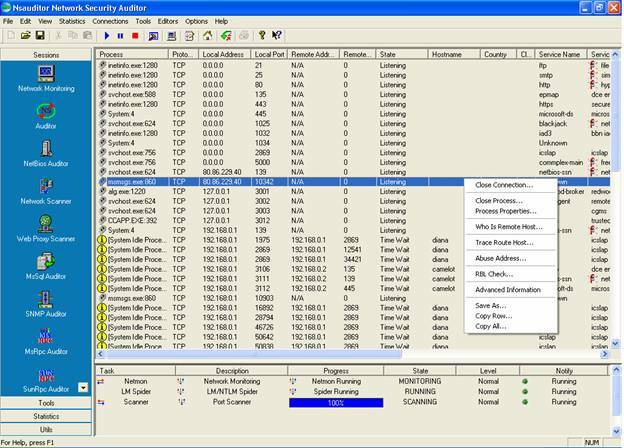 Nsauditor is Network Security and Vulnerability Scanner that gives you the power to scan, detect and correct any potential security risk on your network. Nsauditor allows monitoring network computers for possible vulnerabilities, checking enterprise network for all potential methods that a hacker might use to attack it and create a report of potential problems that were found. One of the biggest shortcomings of Web applications environment is its failure to provide a strong authentication mechanism. In other words, security measures designed to protect a communications system against falsy transmissions don’t seem to be effective. Rather annoying seems to me the frequent failure of attempts from side of developers applying available and effective securing mechanisms. It’s no longer secure to manipulate on the Web using best practices. Security companies have been getting more cautious with offerings and are designing a large variety of solutions for the consumer market aimed at helping Web intruders make more intelligent and informed decisions about the sites they visit and the code they download. So in the aftermath the only true way out is not only to arouse confidence in your visitors but also to prove that your Site is protected against fraudulent transmissions.